On October 26, a delegation of the Syrian High Negotiations Committee headed by Nasr al-Hariri arrived in Moscow and was received at the Russian Foreign Ministry, where it met with Foreign Minister Sergei Lavrov and held extensive consultations with Deputy Foreign Minister Mikhail Bogdanov on the current situation in Syria. Emphasis was made on the need for an early political settlement of the Syrian crisis. According to the statement following the meetings, the Russian side reaffirmed its commitment to sovereignty, independence and territorial integrity of Syria, as well as its focus on effective promotion of an inclusive inter-Syrian dialogue based on the UN Security Council Resolution 2254, as well as the decisions of the Syrian National Dialogue Congress in Sochi. Meetings with Nasr al-Hariri took place earlier in the framework of Russia’s focus on maintaining political dialogue with the patriotic part of the Syrian opposition, which is inclined to think more realistically. The current moment in the Syrian conflict, when conditions are being shaped to shift the focus of international efforts to the political settlement, has a special significance. The visit of the representatives of the Syrian High Negotiations Committee took place on the background of a noticeable activation of Russia’s bilateral and multilateral contacts with leading global and regional players (Germany, France, Turkey, Iran, Saudi Arabia, Qatar). At the centre of intense discussions were such crucial issues for the future of Syria, as its political structure and the composition of the Constitutional Committee, as well as solution of the Idlib issue as to avoid humanitarian consequences and not to block the peace process. Prospects for the return of refugees, further economic reconstruction of the country that suffered a lot during the seven-year civil war and the fight against international terrorism are closely linked with this process. The build-up of efforts by the international community is taking place when the negotiations, which according to UNSC Resolution 2254 should be conducted between Syrians with the UN mediation have stalled. The parties could not move away from the maximalist positions and take the path to mutually acceptable compromises. The National Reconciliation Congress, held at the initiative of Russia in Sochi, gave hope that the Constitutional Committee could be formed soon and joint work would begin on the preparation of a draft constitution for Syria. However, the government and the opposition represented by the Syrian High Negotiations Committee sent lists of their representatives to the Committee with a big delay. This complicated the mission of the special representative of the UN Secretary-General Staffan de Mistura to compile a third list of the so-called independent representatives of various public organizations, not directly associated with either the Syrian government or the opposition. According to the agreements, the selection criteria and procedures are determined under the auspices of the UN. Above all, it is essential to launch the work of the Constitutional Committee in Geneva, which is designed to consider the fundamental questions of Syria’s future state structure. The decisions taken at the Syrian National Dialogue Congress in Sochi must be taken into account in this process. It can be assumed that the whole complex of inter-Syrian disagreements around the launch of the constitutional process was the subject of discussions with the opposition in Moscow. 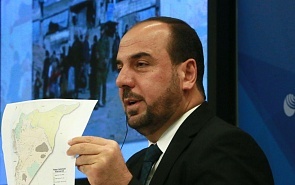 The Riyadh-based Negotiations Committee, which was set up in November 2017 and includes 50 members representing several opposition platforms and organizations in Syria and abroad, was recently under strong pressure from the radical opposition calling not to make concessions and to fight against the “criminal regime” to the bitter end. The transition to the political phase is also taking place in an atmosphere of military-political uncertainty around the Idlib province, where the last major terrorist centre remains. The armed opposition is split, with various actors having different attitude to the requirements of the guarantors of the Astana troika (Russia, Turkey, Iran) about the creation of a demilitarized zone, including the withdrawal of militants and heavy weapons. Under these conditions, such a political wing of the opposition as the High Negotiations Committee, recognized as a partner in the settlement process, is called upon to make the right choice, no matter what internal difficulties within its ranks and accusations of “betraying the interests of the revolution” it faces. It seems that on the way to the state-building there is a great deal of obstacles to be overcome from various sides. It is hardly possible for one side to convince the Syrian government and the scattered political opposition to begin working on the constitution. It is necessary to build an influential international consensus in support of the early work of the Constitutional Committee according to the UN Security Council Resolution 2254. Russia is able to play a leading role as a coordinating centre. Otherwise, the Syrian settlement train may get off the Geneva tracks, while changing the destination can lead to unpredictable traffic accidents.